January of 1997 brought us several weeks of bitterly cold weather. What we got out of it was mild compared to the reports that came out of the Dakotas, but our share was bad enough. We needed our best clothes for this one. For days the temperature didn't rise above ten degrees, and the chill factors were often in the -30 to -40 range. After years of working outside in the winter, I had learned that one must dress for the chill factor, not for the temperature. Temperature as measured by a thermometer is very deceiving. I spent a week in Fairbanks, Alaska, when the temperature reached 35 below zero at night and never went above -5. I found it pleasant, because there was no wind, not even a whisper. Steam from the local power plant rose straight up. This brings to mind an old joke, which I have heard in several forms. Two soldiers are huddled around a fire in northern Alaska. One says, "My gosh, it's fifty below zero!" The other says, "Yeah, but at least we're not in Amarillo." There is a lot of truth in that, and it goes to the matter of chill factor. Amarillo is famous for it's bone-chilling, wind-driven cold. As I was making my daily rounds on the ranch and feeding cattle, I couldn't help wondering how the old-time cowboys survived this kind of weather. 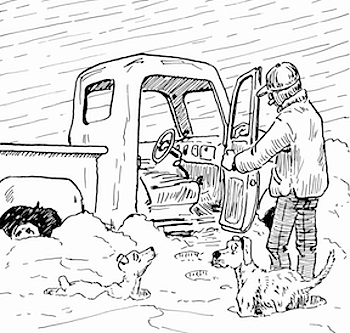 Most days, I was hauling my feed in a heated four-wheel drive pickup. They used an open wagon pulled by mules. I was dressed in clothing purchased from catalog outfits that specialize in outdoor winter apparel. On my head I wore a fur cap made of Canadian badger. My long-john underwear was a blend of wool and cotton. My coat was a down-filled parka. My boots were waterproof and insulated, and I wore ski gloves on my hands. I tried to imagine the cowboys who worked this ranch in the 40's and 50's. This was back in the days when nobody from Texas had ever heard of Cabela's, L.L. Bean, or Eddy Bauer. I remember the clothes we wore in my childhood, and they were inadequate even for playing, much less working, in the cold. What did those old-timers wear, and how did they protect themselves from killer cold? These questions came to me one afternoon when I was feeding cattle in our old 1953 Dodge army truck. With four-wheel drive and snow chains on the back tires, it was a very effective drift-buster and a great feed wagon...except for one small detail. It had a canvas top, no windows, and the heater didn't work. Driving it around the ranch with the temperature near zero, I realized that the temperature inside the cab was not only as cold as outside; it was twice as cold, because of the chill factor created by the movement of the truck. The wind that whistled through the open cab must have been fifty below zero, and my best ski gloves flunked out in half an hour. I had to return to the house and run water over my hands, and they ached so badly, I thought of taking aspirin. So how did those old guys feed cattle all day in an open wagon, dressed in whatever clothes they had managed to buy at the local dry-goods store? One possibility is that they were quite a bit tougher than my generation of ranchers and cowboys. I would hate to admit that. Call it vanity or whatever you wish, I just don't want to believe it. That leaves one other possibility. It is the simplest explanation and therefore it may be the closest to the truth. When the weather was unbearable, they stayed inside by the fire. They read books, repaired broken headstalls, braided horsehair do-dads, and chunked up the stove with cedar and hackberry logs, knowing that the cattle would still be there when the storm passed. I don't expect to hear this from an old-timer. It doesn't make as good a story as an eye-popping tale of driving mules into a blizzard, but it makes sense to me. In other words, they survived Panhandle winters because they were smart. With our heated pickups and L.L. Bean clothes, we don't have to be smart. They did, and in this country in the wintertime, that means you don't pick fights with Mother Nature. And…okay, maybe they really were tougher. I'll go ahead and admit it.